A book to help parents to make their children's digital playtime educationalDigital play, when used appropriately, can be a powerful tool for learning skills such as planning, time management, cooperation, creativity, and digital literacy. The book’s clearly articulated strategies help parents use digital media in a more effective manner and, at the same time, set effective limits and implement a healthy “play diet” for their children. A section devoted to exploring specific strategies for using digital media with children in specific populations—such as children affected by ADHD, autism spectrum and learning disorders, and other mental health and educational issues—is also featured, as is a list of specific games, apps, and tools to make game-based learning most effective. 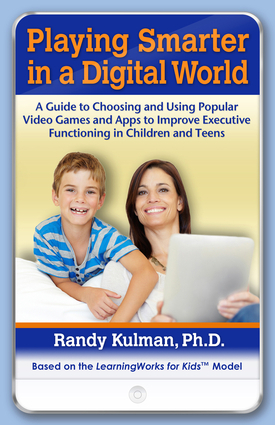 Randy Kulman, PhD, is the founder and president of LearningWorks for Kids, an educational technology company that specializes in using video games to teach executive-functioning and academic skills. For the past 25 years, he has also been the clinical director and president of South County Child and Family Consultants, a multidisciplinary group of private practitioners that specializes in assessment and interventions for children with learning disorders and attention difficulties. He is the author of Train Your Brain for Success and is the coauthor of a chapter in the book Designing Games for Ethics: Models, Techniques, and Frameworks. He lives in Wakefield, Rhode Island.